Renal afferent and efferent sympathetic nerves play a crucial role in the activation of the sympathetic nervous system, implicating them in the pathogenesis and progress of arterial hypertension as well as other cardiovascular disorders. This makes them an appealing target for the treatment of the aforementioned dysfunctions . Hypertensive patients are known to have an augmented renal norepinephrine spillover, mediated by increased sympathetic innervation of the kidneys . In 2009, Krum et al. demonstrated that percutaneous catheter-based renal sympathetic denervation with the use of radiofrequencies (RDN) was both safe and effective in reducing blood pressure (BP) in patients with resistant hypertension . This beneficial effect was found to be sustained over time [4, 5]. The long awaited Symplicity-HTN 3 trial failed to show any significant difference in BP lowering between the RDN and the sham-procedure arm of the study . However, as the study came under a lot of criticism, there is still optimism about the role of RDN in the treatment of resistant hypertension. Identification of patients with increased sympathetic activity thus being good RDN responders, improvements in the RDN procedure(better ablation techniques, ablation at distal parts of the renal artery) and new technology RDN catheters are all expected to lead to better RDN results . We present our initial experience with RDN for the treatment of resistant arterial hypertension, and the utility of novel anesthetics and cardiac 123I-metaiodobenzylguanidine scintigraphy (123I-MIBG). From April 2012 to April 2014, 7 patients underwent RDN in our department for the treatment of resistant hypertension. All patients were referred to us from the Hypertension clinics of Northern Greece hospitals after false resistant and secondary hypertension were excluded, and appropriate lifestyle modifications had already been implemented. Strict adherence to medication and compliance with lifestyle modifications were confirmed for at least 6 months. Patients were considered eligible to undergo RDN if they had an office systolic BP (SBP) ≥160 mmHg, despite being treated with maximum doses of at least 3 antihypertensive agents, including one diuretic. All of them were adults, not pregnant, had an estimated glomerular filtration rate (eGFR) of ≥45ml/min/1.73 m2 and had no significant valvular disease or prior renal stenting or angioplasty. All patients underwent CΤ-angiography prior to RDN to exclude renovascular abnormalities (anatomy variation or renal artery stenosis>50%). In 5 patients (71.4%) RDN was performed with the Symplicity catheter (Ardian Inc, Palo Alto, CA, USA). The catheter was inserted via the right femoral artery into each renal artery, with the patient being mildly sedated, using intravenous dexmedetomidine and remifentanil. Separate radiofrequency ablations of 8 Watts or less, each lasting up to 2 min were delivered in each renal artery. The catheter was moved both longitudinally and rotationally in order to achieve multiple ablations in different sites of each renal artery wall. During ablation, the temperature and impedance of the catheter tip were continuously monitored and the amount of energy delivered was altered in an automated, default way. Both renal arteries were ablated in the same procedure. In 2 patients (28.6%) RDN was performed with the EnligHTN T multi-electrode system (St Jude Medical, St Paul, MN, USA). The basic principles of the procedure were the same as above. This denervation system allowed 4 ablations to be performed simultaneously for 60 sec by the electrodes forming its basket. More ablations could be delivered, if indicated, using all or part of the electrodes, after repositioning the catheter in the renal artery. As mentioned above, all 7 patients were consciously sedated by our anesthesiologist who took part in the procedure, with the use of 2 novel intravenous anesthetics, i.e. dexmedetomidine and remifentanil. During the procedure, arterial pressure, heart rate, level of sedation and level of analgesia were recorded. Level of sedation was measured using the Ramsay score and analgesia was measured using a visual analogue scale (VAS) with a 100-mm horizontal scale of 0 (no pain) to 10 (worst pain). Before RDN, physical examination, measurement of vital signs, 24-h ambulatory BP recording, review of medication and essential blood tests (including serum creatinine levels) were performed. Follow-up evaluation took place at 1, 3 and 6 months post-denervation and consisted of evaluation of adverse events (death from any cause, end stage renal disease, embolic events, hypertensive crisis), physical examination, office BP measurement, 24-h ambulatory BP recording, other vital signs, blood tests (serum creatinine included) and review of medication. For follow-up appointments, patients were advised to have their morning medication taken before examination. Office BP was measured 3-times, in both arms, and averages of the triplicate measures were recorded. Renal imaging was performed at 6 months either by CT-angiography or renal Duplex. Patients were strongly advised to remain adherent to their prescribed antihypertensive medication, while any medication discontinuation or alteration was discouraged, unless medically required. Treated patients were characterized as responders if they had reductions in office SBP ≥ 10 mmHg at all time points within 6 months after the intervention. If they failed to reach the aforementioned target, they were considered non-responders. Cardiac 123I-MIBG imaging was performed in 4 patients in order to estimate sympathetic activity and predict response to RDN. All 4 patients had no history or manifestations of coronary artery disease. Cardiac 123I-MIBG was performed after thyroid blockade and without discontinuation of the antihypertensive medication, as suggested elsewhere . Patients provided informed consent before the procedure. Planar anterior images were acquired at 15 min and 4 h after injection of 185 ΜΒq of the radiotracer and the heart-to-mediastinum (H/M) count density ratio was calculated at those time points in a standardized manner, together with the washout rate (WR) of the tracer from the myocardium . Treated patients were all Caucasians (mean age:64±5.7 years) and the majority (n=5, 71.4%) were female. Their baseline characteristics are summarized in Table 1. Before RDN, they had a mean eGFR of 86 ±19 ml/min/1.73m2. Their office BP at enrollment was 173 ±9/96 ±14mmHg and heart rate 64 ± 8 beats/min (bpm), while their 24-h ambulatory BP was 159 ±17/90 ± 9 mmHg. They were taking 5.9 antihypertensive agents on average. All 7 of patients were receiving an ACE-inhibitor or AT-II receptor blocker, a calcium channel blocker and at least one diuretic (100%), 6 a beta-blocker (85.7%), 6 a centrally acting sympatholytic (85.7%), 5 an aldosterone antagonist (71.4%), 1 an α1-adrenergic blocker (14.3%) and none on a direct vasodilator or direct renin inhibitor (Table 2). Patient baseline characteristics before renal denervation. Antihypertensive therapy before and 6 months after renal denervation. The procedure lasted 80±41 min on average. The mean duration in the multi-electrode system (EnligHTN T) subgroup was significantly shorter (37± 22 min) compared with the Symplicity catheter subgroup (97 ± 34 min, p <0.01). A median of 8±2 and 6 ±1 ablations were delivered in the right and left renal artery respectively, making an average of 7 burns per artery. The total number of burns was significantly higher in the EnligHTN T system subgroup (9 vs 6 burns per artery, p <0.01). One patient had an accessory right renal artery, which was not ablated due to its small diameter (<3.0mm). RDN was well tolerated by all patients, as they were mildly sedated using intravenous dexmedetomidine and remifentanil. During the procedure, patients had a Ramsay score of 2-3 and were hemodynamically stable with no significant changes of mean arterial pressures and heart rate. During delivery of the ablation currents, all of them experienced a minimal discomfort (Visual Analog Scale - VAS score 2-3) but remained very tranquil, cooperative and immobile. No episodes of significant oxygen desaturation (oxygen saturation levels < 90%) were noted and after the end of the procedure the patients were tranquil and free of pain. Regarding procedure safety, all 7 treatments were completed without any peri-procedural complications. Furthermore, regarding chronic safety, renal artery imaging, 6 months after RDN, showed no vascular abnormalities at any site of radiofrequency delivery in treatment locations. Follow-up visits took place at 1, 3 and 6 months after denervation. 6 patients (85.7%) were responders and 4 patients (57.1%) had controlled BP (<140/90 mmHg) following renal denervation. At 6 months mean reduction in office BP was -26/-16 mmHg (p=0.004/p=0.02) (Fig. 1a), while mean reduction in 24-h ambulatory BP was -12/-9 mmHg (p=0.118/p=0.045) (Fig. 1b). In the responders subgroup (n=6), mean office BP reduction was -30/-19 mmHg (p=0.0002/p=0.016), while mean ambulatory BP reduction was -14/-10 mmHg (p=0.028/p=0.05). Of note, patients were advised not to change their medication during follow up, unless there was a clinical need and only under supervision of the treating physician. The average number of antihypertensive drugs per patient was 5.9 at baseline, and 5.6 at 6 months, finally, 4 out of 7 (57.1%) remained on the same antihypertensive therapy during follow up. One of them (14.3%) reduced the number of antihypertensive agents from 6 to 4 (interruption of aldosterone antagonist and centrally acting sympatholytic) and one (14.3%) reduced the dosage of centrally acting sympatholytic, while the non-responder was advised to further augment the dosage of the calcium channel blocker. 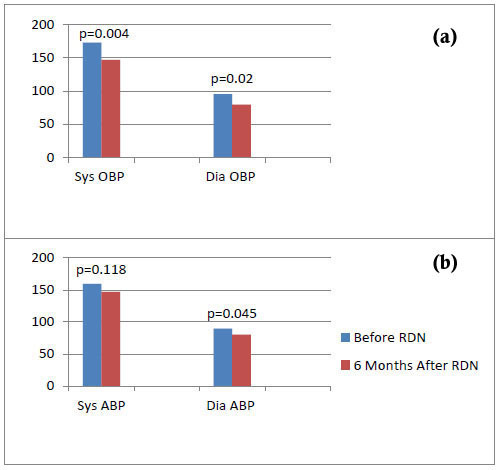 Mean values of systolic (Sys) and diastolic (Dia) office (OBP - top) and ambulatory blood pressure (ABP – bottom) before and 6 months after renal denervation (RDN). With the reservation of the very small number of cases, there was no significant correlation between response to interventional treatment and any index of 123I-MIBG imaging (WR of the tracer from the myocardium was 34±8% and 32% in the responders and non-responder subgroups, respectively, p>0.05). Moreover, the semiquantitative assessment of the cardiac presynaptic sympathetic activity with 123I-MIBG could not identify potential responders to RDN (early and late H/M count density ratio were 1.84±0.22 vs 1.85±0.14 and 1.54 vs 1.61 in the responders and non-responder subgroups, respectively, p>0.05 for both). During follow up there were no orthostatic or electrolyte disturbances. Furthermore, there was no significant change between baseline and 6 months in mean heart rate (64±8 and 64±6bpm, respectively), and mean eGFR (86±19 and 80±13 ml/min/1.73m2). We present our initial experience on 7 patients who underwent RDN for the treatment of resistant hypertension and the utility of novel anesthetics and 123I-MIBG. Regarding procedure safety, there were no procedural complications, and renal function did not deteriorate as shown by the non-significant changes in eGFR. Furthermore, neither systematic, nor local (renal artery stenosis, dissections or aneurysms) adverse events occurred during follow up. Our results are concordant with those of the Symplicity-HTN 1, 2 and 3 trials, as all of them documented lack of complications with RDN [3, 6, 10]. The treatment was well tolerated by all patients, who were hemodynamically stable, and peri-procedural pain was effectively controlled in all with the novel intravenous analgesics and sedatives, i.e. dexmedetomidine and remifentanil. This allowed an adequate number of ablations to be performed per artery. The routine analgesic and sedative treatment in patients undergoing RDN includes intravenous morphine sulphate or fentanyl and midazolam or temazepam . We decided to use dexmedetomidine and remifentanil after the suggestion of our anesthesiologist, because this combination has favorable characteristics, including better patient controllability, greater hemodynamic stability, reduced analgesic requirements and minor respiratory depressant activity. Dexmedetomidine is a short-acting, highly potent, selective α2 adrenoceptor agonist with unique properties of sedation and analgesia compared with the above mentioned routinely used drugs for sedation during RDN. It produces analgesic, sedative, amnesic, and anesthesia-sparing properties with minimal respiratory depressant activity and great hemodynamic stability. Furthermore, dexmedetomidine significantly enhances the analgesic effect of opioids including remifentanil and reducing the cumulative analgesic requirements, leading to less hypotension, oversedation or respiratory depression. On the other hand, remifentanil, a μ receptor agonist, appeared to be an ideal analgesic component not only for the rapid onset of analgesia but also for the fast offset of action due to hydrolysis by non-specific esterases, offering favorable controllability [11-13]. It should be mentioned that patient comfort during the procedure can probably allow a higher number of ablations per artery, which is related to better RDN results . Regarding efficacy, RDN was found to be effective in 6 out of 7 patients (85.7%), leading to a significant reduction of office SBP and diastolic BP 6 months after the procedure. The safety and encouraging effectiveness of RDN had already been demonstrated by the Symplicity-HTN 1 and Symplicity-HTN 2 clinical trials , as well as the Global Symplicity registry, which also demonstrated greater BP reductions in patients with higher baseline BP . However, the latest randomized control trial regarding RDN, Symplicity-HTN 3, failed to show significant difference in BP reduction between the two arms of the study . This may be due to several factors. First, the procedure itself, as the number of ablations per artery varied from center to center (an average of 9 appropriate ablations of 120 sec were delivered in each patient, in contrast with 11 ablations of the same duration in the Global Symplicity Registry), the operators were inexperienced with RDN (an average of only 3 procedures were performed by each operator, with 34% of them doing only a single procedure, while almost 75% of patients did not receive ablations in all 4 quadrants of both renal arteries), and the RDN catheters were first-generation mono-electrode systems [14, 17]. Patient stabilization to antihypertensive treatment before randomization is also under question, since BP measurements were recorded for only 2 weeks after dosage adjustment, a period known to be quite short for some antihypertensive agents to reach their maximum effect. Finally, the trial’s failure may simply be due to the fact that RDN is not effective for all resistant hypertensive patients, but probably for some patient subgroups (obese individuals with baseline SBP rates>180 mmHg seemed to present greater BP reductions after the procedure) [18, 19]. In our registry, patients were admitted to our clinic as denervation candidates, after adherence to maximum tolerated dosages of antihypertensive agents, as well as lifestyle modifications were confirmed for a period of at least 6 months. The number of antihypertensive drugs taken at enrollment was 5.9 (Symplicity-HTN 3 patients were taking 5), a fact that, in addition to the prolonged monitoring before treatment, strengthens the diagnosis of true resistant hypertension. None of our patients was receiving direct vasodilators, a category of antihypertensive drugs known to be a predictor of non-response to renal denervation [18 , 19]. A total of 7 denervations were performed by a single operator, in contrast with a median of only 3 interventions performed by each one of 111 operators of the Symplicity-HTN 3 trial. An average of 13.6 bilateral ablations were performed in each patient (9.2 burns were performed in Symplicity-HTN 3 patients), while 28.6% (n=2) of our patients were treated with a novel, multi-electrode catheter (EnligHTN T system) with which up to 4 burns took place simultaneously, leading to a greater number and efficacy of ablations. All the above may justify the high rates of RDN success in the patients of our registry. Of note, the single non-responder patient had an accessory renal artery which was not ablated due to its small diameter, as suggested by RDN guidelines , and this could be the reason for not responding to RDN. Finally, improved RDN results are expected, if we could identify patients with increased sympathetic nervous activity (SNA) thus being good RDN responders. Measurements of plasma or urine noradrenaline levels or heart rate variability as indicative of SNA are easy to perform, but lack reliability and sensitivity. Recordings of muscle SNA, usually from the peroneal nerve seem to be more accurate, while radiotracer technology is considered gold standard in SNA evaluation . We used cardiac 123I-MIBG imaging in an attempt to assess the sympathetic overactivity. This way we tried to determine increased SNA, and relate this to RDN response. It has been reported previously that excessive norepinephrine release leads to diminished presynaptic function of the cardiac sympathetic system from loss of neurons and downregulation of the norepinephrine transporter 1, which would be manifested by decreased H/M ratios . However, no cardiac123I- MIBG imaging index (early and late H/M, WR) was correlated to response to interventional treatment. Nevertheless, due to the very small sample size no conclusions can be drawn. Careful selection of truly eligible patients, thorough follow-up and treatment adjustment, novel RDN technology used by experienced operators in addition to new, large, well-designed randomized clinical trials, may be the key to success of the procedure in resistant arterial hypertension as well as multiple cardiac and non-cardiac morbidities [ 22, 23]. Furthermore, the use of novel anesthetics, and the use of MIBG may be also helpful, with the latter needing further research in order to document its role in improving RDN success. A major limitation of the current study is the small number of patients enrolled, which minimizes its generalizability. Another limitation is the lack of randomization. New, large-scale, randomized trials are needed in order to clearly demonstrate the potent role of novel anesthetics and MIBG in RDN outcomes. Ji M, Shen L, Wu YZ, et al. Short-term safety and efficiency of cryoablation for renal sympathetic denervation in a swine model. Chin Med J (Engl) 2015; 128(6): 790-4. Schlaich MP, Sobotka PA, Krum H, Lambert E, Esler MD. Renal sympathetic-nerve ablation for uncontrolled hypertension. N Engl J Med 2009; 361(9): 932-4. Krum H, Schlaich M, Whitbourn R, et al. Catheter-based renal sympathetic denervation for resistant hypertension: a multicentre safety and proof-of-principle cohort study. Lancet 2009; 373(9671): 1275-81. Krum H, Schlaich MP, Sobotka PA, et al. Percutaneous renal denervation in patients with treatment-resistant hypertension: final 3-year report of the Symplicity HTN-1 study. Lancet 2014; 383(9917): 622-9. Esler MD, Böhm M, Sievert H, et al. Catheter-based renal denervation for treatment of patients with treatment-resistant hypertension: 36 month results from the SYMPLICITY HTN-2 randomized clinical trial. Eur Heart J 2014; 35(26): 1752-9. Bhatt DL, Kandzari DE, O’Neill WW, et al. A controlled trial of renal denervation for resistant hypertension. N Engl J Med 2014; 370(15): 1393-401. Epstein M, de Marchena E. Is the failure of SYMPLICITY HTN-3 trial to meet its efficacy endpoint the “end of the road” for renal denervation? J Am Soc Hypertens 2015; 9(2): 140-9. Travin MI. Cardiac autonomic imaging with SPECT tracers. J Nucl Cardiol 2013; 20(1): 128-43. Flotats A, Carrió I, Agostini D, et al. Proposal for standardization of 123I-metaiodobenzylguanidine (MIBG) cardiac sympathetic imaging by the EANM Cardiovascular Committee and the European Council of Nuclear Cardiology. Eur J Nucl Med Mol Imaging 2010; 37(9): 1802-12. Esler MD, Krum H, Sobotka PA, Schlaich MP, Schmieder RE, Böhm M. Renal sympathetic denervation in patients with treatment-resistant hypertension (The Symplicity HTN-2 Trial): a randomised controlled trial. Lancet 2010; 376(9756): 1903-9. Arain SR, Ruehlow RM, Uhrich TD, Ebert TJ. The efficacy of dexmedetomidine versus morphine for postoperative analgesia after major inpatient surgery. Anesth Analg 2004; 98(1): 153-8. Lin TF, Yeh YC, Lin FS, et al. Effect of combining dexmedetomidine and morphine for intravenous patient-controlled analgesia. Br J Anaesth 2009; 102(1): 117-22. Hall JE, Uhrich TD, Barney JA, Arain SR, Ebert TJ. Sedative, amnestic, and analgesic properties of small-dose dexmedetomidine infusions. Anesth Analg 2000; 90(3): 699-705. Kandzari DE, Bhatt DL, Brar S, et al. Predictors of blood pressure response in the SYMPLICITY HTN-3 trial. Eur Heart J 2015; 36(4): 219-27. Gomez SI, Urbandt P, Beohar N, Santana O. Renal denervation: current status and future applications. Rev Cardiovasc Med 2014; 15(4): 351-7. Böhm M, Mahfoud F, Ukena C, et al. First report of the Global SYMPLICITY Registry on the effect of renal artery denervation in patients with uncontrolled hypertension. Hypertension 2015; 65(4): 766-74. Mahfoud F, Mancia G, Schlaich MP, et al. Reduction in office blood pressure after renal denervation in a large real world patient population with uncontrolled hypertension: interim 12-month results from the global symplicity registry . Presented at the European Society of Cardiology; Barcelona. 2014; p. 62. Briasoulis A, Bakris G. Renal denervation after SYMPLICITY HTN-3: Where do we go? Can J Cardiol 2015; 31(5): 642-8. Lüscher TF, Mahfoud F. Renal nerve ablation after SYMPLICITY HTN-3: confused at the higher level? Eur Heart J 2014; 35(26): 1706-11. Mahfoud F, Lüscher TF, Andersson B, et al. Expert consensus document from the European Society of Cardiology on catheter-based renal denervation. Eur Heart J 2013; 34(28): 2149-57. Malpas SC. Sympathetic nervous system overactivity and its role in the development of cardiovascular disease. Physiol Rev 2010; 90(2): 513-57. Lewek J, Kaczmarek K, Pokushalov E, Romanov A, Cygankiewicz I, Ptaszynski P. Renal denervation--hypes and hopes. Cardiovasc Ther 2015; 33(3): 141-4. Olsen LK, Kamper AL, Svendsen JH, Feldt-Rasmussen B. Renal denervation. Eur J Intern Med 2015; 26(2): 95-105.